WINNING IS SUCH FUN... I've said that so many times, but only because it's true! It doesn't even really matter what you win, it's the "winning' that's so fun! I won! I won! But winning something you really wanted in the first place, wow! Like a book. If you're a bookworm it doesn't get anymore fun than that! Let me warm up my coffee, and I'll be right back to tell you all about my recent win. Well—I go on Seekerville pretty much every morning. The Seekers are a group of writers that write some of the very best, clean romance novels for those of us that like to read heartfelt, warm, emotional and inspiring stories. No worries about having a pen handy to scratch out words I don't like, or use myself. As a struggling writer, I learn from the guest authors that the Seekers invite to share tips, and advice, from their own hard won knowledge about the craft of writing. One of those generous authors was Erica Vetsch. I'd never read any of Erica's books, but I really enjoyed her guest blog one morning about 5:30 am. I never expected to win a book, but I wanted her to know how much I enjoyed her article. So I commented. 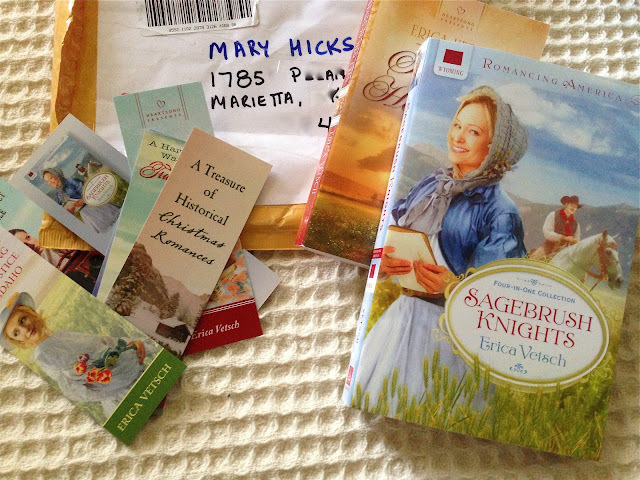 And then I won a copy of SAGEBRUSH KNIGHTS—You'd think I'd won the Lottery! And in a way, I had. I'm now an official Erica Vetsch fan—for life! I've read tons of books, and I can say with a true heart, that I've never enjoyed a book anymore than I enjoyed SAGEBRUSH KNIGHTS. Erica had it all going—I stayed up all night to finish, and hoped the end was as good as the story promised—it was! Story, plot, wonderful characters, family values, tender romance, hardships to overcome, while keeping a christian attitude—it was all there, and she tied it up with a 'perfect ending' big red bow!